I told you all how I make our Spaghetti. Now, as promised, I will share how I make my yummy garlic cheese bread on the stove top. You know that flavor of baked on cheese? Sure you do! Like when you have lasagna... or pizza... and the little bits around the edges are a little "over" baked... you know, the parts everyone fights over? It's like that. Yeah, I thought that might get your attention! Hmmm... if that didn't, look at this! Start heating a pan up on the stove. You're going to want to sue a non-stick pan or a very well seasoned iron skillet... otherwise the cheese will stick... not cool. 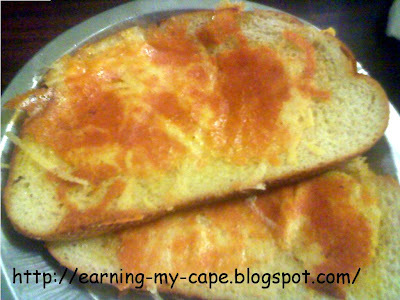 Spread butter on both sides of each slice of bread. Sprinkle with a little garlic salt. Sprinkle one side of the bread with cheese, add a little dab of butter to the pan, then place the bread cheese side down in the hot pan. 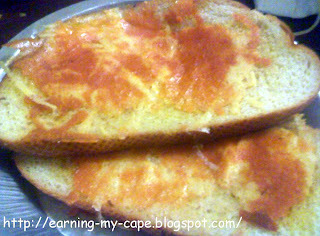 Sprinkle a little cheese on the top of the bread, and let the other side cook until it is golden (the other side... not the top). Flip the bread and let that side cook up until golden. Remove from pan and serve. Yum! You don't want a riot at the dinner table! great idea- I don't have a seasoned cast iron skillet but might work with a good nonstick skillet. this is one i am definitely trying in the next few days, i can almost smell how good this looks from here!